While out and about this week coming RTR members might want to be on the lookout for my latest guests. Two new style KLRs from Tennesee in green and they are road loaded headed west. Great folks with a long distance to travel and no time limits other than winter. Will keep an eye out for them! Saw a green Triumph Tiger in Kelligrews on Friday at afternoon. The rider had a hi-vis helmet. 'Twere I. Took off from work a bit early and felt the need to spin the wheels and top up the tank on that cheap CBS fuel. I was passed by a V-Strom on Pitts memorial today by a lady in hi viz. Tokenblonde possibly. I was going uphill in a headwind on the scooter so I was tucked as aerodynamic as I could get. Probably looked like I was having a stroke with my head on the handlebars and my arm tucked in under my chest trying to get up to speed. Haha, yep that was me. I thought that was you, Murph. Now I know what I looked like on Saturday when I was trying to get the TW up to speed to merge onto the TCH from the Witless Bay Line. 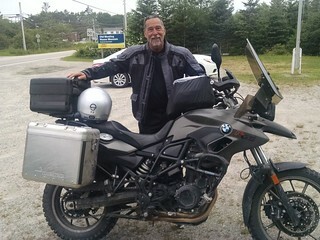 Saw a number of bikes heading West on the TCH between Clarenville and Chance Cove as we were heading to St. John's. Soirée bound perhaps? The fog was pretty dense around Chance Cove. I made sure I looked closely for a black RT at every Lighthouse I passed on the South Coast. Sooner or later I figured I might track you down, you old Salty Dog! The pleasure was all mine, Chuck. Thought I saw Herrdeacon and his 500X in deer lake on Tuesday afternoon. I wish I could say it was, but sadly I've hardly been on the bike this year, need to do something about that. I saw a black BMW with very bright LED's, maybe Clearwaters? Spotted near doe hills...maybe Chuck?? Weather was nasty....probably the worse wind, rain, fog and dark clouds that I have ever ridden in! Probably him, he is runnig Clearwaters. Saw two Urals on Saturday afternoon around 4:30 - ish, in Gander Irving / Tims parking lot. The were travelling west. Saw them at Gambo Saturday afternoon. Queerest tking just happened.... I was having' a quick bath, the wife was cooking supper and someone rang the doorbell but rode off almost immediately after... wife went to the door almost immediately and I could hear her shout but I guess the rider was committed by that time. She said he had a high vis helmet and jacket with a Givi top box. Another 10-15 seconds and whoever it was would have lucked out on a good feed of chicken nachos washed down with Okanagan Cider.